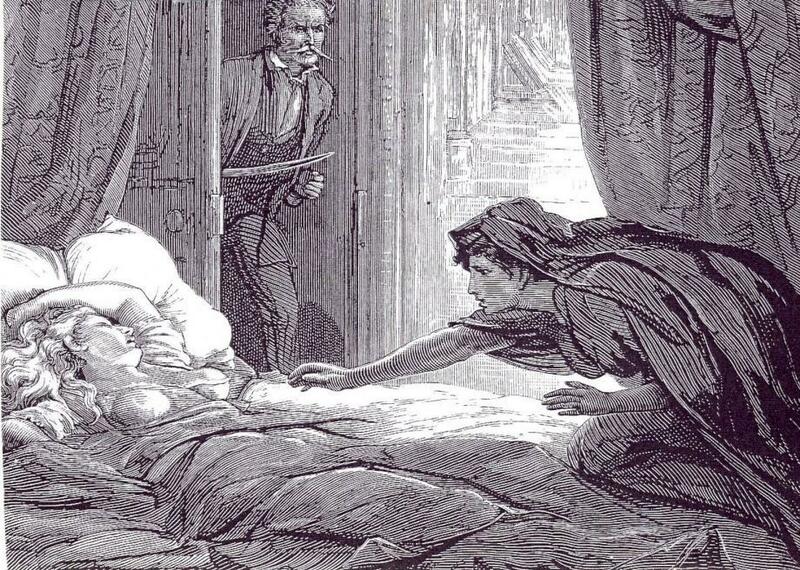 Joseph Le Fanu's Carmilla is the lesbian vampire story that came before Dracula. An illustration for Joseph Sheridan Le Fanu’s novella, Carmilla. When thinking of the origins of Vampire literature in the Western world, chances are you think of Bram Stoker’s Dracula. This chef-d’oeuvre has defined the genre ever since it was published more than 100 years ago. Written in 1871, the novella is a first-person account from Laura, a young English woman who falls prey to a beautiful vampire. In some detail, Laura tells us of a curious incident that brings Carmilla, a stranger, into her home. At first, she is scared of the newcomer, who looks exactly like a specter she had seen in a nightmare when she was a child. But these feelings quickly subside and are replaced by an ardent relationship that blossoms with intensity. In the meantime, panic arises as maidens from nearby towns are afflicted by a mysterious illness that causes their deaths. Eventually, Laura herself becomes ill and has recurring nightmares of a giant cat that attacks her at night. As a strange twist of fate, a general who has lost his niece to the illness comes to visit Laura’s father. He is now aware of the reality of vampires and is on the hunt for Millarca—as he knew Carmilla. When the two unexpectedly come face to face, a fight ensues and Carmilla, now exposed, flees. After the incident, Laura is taken back and guarded by several people. Meanwhile, her father, the general, and a vampire hunter find Carmilla’s hidden tomb, drive a stake into her heart, decapitate her, and burn her remains. Laura recovers her health, but never fully, and continues to be haunted by the memory of Carmilla for the remainder of her short life. Most scholars agree that Carmilla heavily influenced Dracula, as elements of the first appear in the latter, though modified or amplified. The aesthetic of the female vampire, for example, is very much the same in both stories. They have rosy cheeks, big eyes, full lips, and almost irresistible sensuality. There is also the vampire hunter who comes to the rescue and imparts his knowledge of the obscure on the confused victims. Even the narrative frame of Stoker’s masterpiece is quite similar to Le Fanu’s: first-person accounts from the victims. But what makes Carmilla so endearing are not its similarities to other works of the genre but its distinct differences. Most notably, the fact that the story is centered around two female characters, whose complicated relationship is colored by thinly veiled lesbian undertones. The novella was written during the Victorian era, a period known for its strict moral laws and sexual repression, so no wonder vampire novels rose into prominence. The premise of these novels is that even the most pure of hearts cannot resist the supernatural seduction. This idea was extremely attractive for the Victorian upper class, especially women, whose desires have always been rigidly restricted. However, powerlessness does not mean redemption or absolution, as these powers are understood to be evil and tied to devilish forces. In almost every vampire story, the women who are preyed upon meet their deaths, unless the men in their lives come to their rescue. As such, the vampire trope simultaneously provided an outlet for repressed sexual desires and a moral lesson on the danger of succumbing to such desires. In this sense Laura is the perfect victim of vampire literature. She is at once repulsed and drawn to the vampire, both wishes to succumb to and withdraw from her feelings for the strange and beautiful creature. And the fact that the beautiful creature is an irresistibly lovely woman only makes her feelings more confusing. I experienced a strange tumultuous excitement that was pleasurable, ever and anon, mingled with a vague sense of fear and disgust. […] I was conscious of a love growing into adoration, and also of abhorrence. Laura isn’t alone in her feelings. While we are given to understand that most of her victims are of no importance to her, Carmilla is genuinely enamored of a few of them. She seems to have fallen for her victim. In these moments of frenzied rapture, she implies that for them to become one, Laura must die. To drink Laura’s blood was to become one with her forever. As it stands, Carmilla is the antithesis of the heteronormative and male-centered world to which vampires were constricted to after Dracula. It has inspired several remakes as well as a plethora of lesbian vampire tales, including a Canadian web series of the same name. Given the historical context, it is not surprising that the novella did not gain much attention when it was initially written. Now that it’s been 145 years, it is time for Carmilla to rise from the grave.